Solar panels continue to produce high voltages even with a limited amount of sunlight. Solar circuits on board a boat should be protected with a disconnect to allow safe servicing of equipment. 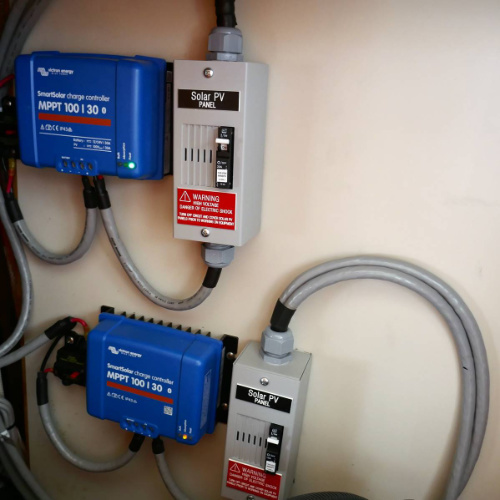 e Marine is pleased to be able to offer this installation kit that allows your solar circuit to be disconnected from the charge controller. The circuit breaker allows for quick disconnect of the solar panels when you are off the boat providing additional safety. This breaker box comes with a warning /circuit label and connects between the solar panels and the charge controller of the solar system. Must be installed in a dry location only.